Campese Ma’afu says the past six weeks have been the toughest of his career. But the prop believes he will reap the rewards of Saints’ painstaking pre-season as he bids to propel the club to glory this season. Ma’afu moved to Franklin’s Gardens in February, having impressed the Northampton coaching staff during Fiji’s World Cup campaign. And this summer the former Nottingham loosehead has been able to get stuck into full preparations for the new campaign, which begins with an Aviva Premiership home game against Bath on Saturday. “I’ve found it quite tough,” Ma’afu said. “It’s the first pre-season for me for three years and Northampton have always had a reputation for the toughest pre-season in the Premiership so I was building myself up for that. As he alludes to, Ma’afu has not been part of pre-season preparations at clubs in recent years as he has often been away representing Fiji. But he knew what to expect at Saints having spoken to elder brother Salesi, who spent two seasons at the Gardens between 2013 and 2015. “I was definitely dreading the training and with any elite player they’re always dreading pre-season,” said the 31-year-old. “They want props to hit certain targets here and there is a lot of running, which, for me, has always been a challenge. “Saints got me on track and I’ve still got little targets here and there to hit, but it should be fine. 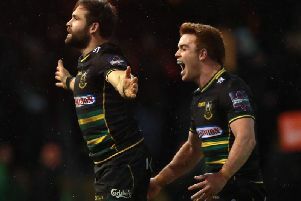 And now Saints will put all of that hard work behind them and get stuck into the competitive business of Premiership rugby. “It’s my first proper season in the Premiership and we’re all really looking forward to it,” Ma’afu said. “There’s a lot of emotions going into this weekend because finishing outside the top four last year wasn’t what we expected.